When I have started my blog, I found that Chittagong has vast collections of many authentic Bangladeshi recipes . I love to share those authentic recipes with my readers. In this Chittagonian journey my first recipe is Beef Biryani /Akhni Biryani which is famous in mejban. Big thanks go to my lovely sister in law (Urmee) for this recipe. As you can see it dish with lots of spices. But interesting part is that my Aussie brought up daughter just loves this Biryani. She calls it spicy rice. 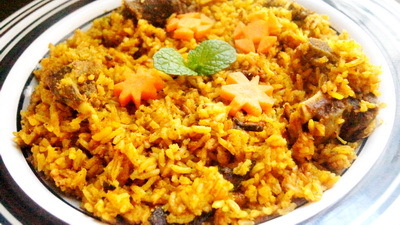 Only this biryani is cooked with turmeric which gives different look and taste.Hope you will like this Biryani too. 1. Take all ingredients of meat including water in a cooking pot and mix them. 2. Boil them until the meat is cooked. 3. When it becomes dry, add sugar and keep aside. 4. Take water in a heavy bottomed sauce pan and bring to the boil. 5. Add rice to the boiling water and when it is boiling point, add meat, green chilli, milk and kewra water. 6. Stir well to mix all ingredients together and cook it in a very low heat for 10-15 minutes under closed lid. 7. At the end add ½ cup ghee and check salt. Cook it on low heat 5 more minutes and remove from heat. 8. Beef Biryani /Akhni Biryani (Chittagonia style) is ready to serve. That’s what I call authentic recipe. Well done Rownak. Every Chittagonian will love you for this. Thanks Sazzad. I am delighted to read your comment. Wow, color, texture are beautiful, reminds me the mejban of Chittagong. It has wonderful colour and texture with very hot flavour. After that Izma likes this Biryani. This food meant to be hot and trust me it tasted best if hot enough. Its not for everyone but who likes this they actually love it. It is very hot but as you know that hot food is the best food. Thanks. thanks for the recipe, it reminds me of chittagong mejban because I am from chittagong. Also, the rice used in Akhni Biriyani is parboiled rice, not the kalijeera or basmati. Thanks a lot Nazim for your tips and I am adding in recipe. Thanks again.